One of the special memories I have from childhood Christmases is that one year we went to see A Christmas Carol at Ford Theatre in Washington D.C. This is the theatre where Abraham Lincoln was assassinated. At the time I didn't have a lot of appreciation for history, but even I was impressed to walk inside and look around. 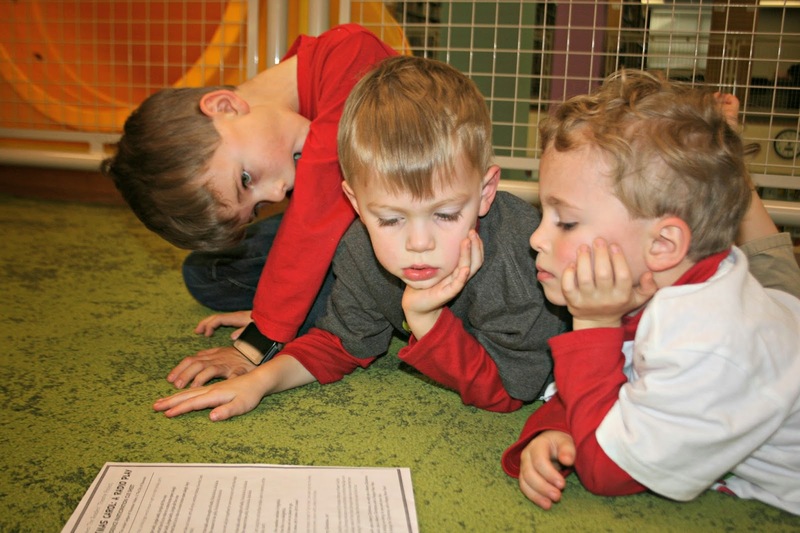 They show A Christmas Carol there every year, and while we aren't in a position to go see it at Ford Theatre this year, I was able to take the boys to a mini spin off of the play that was done by Mill Mountain Children's Theatre at the downtown Roanoke library. It was an unusual production. 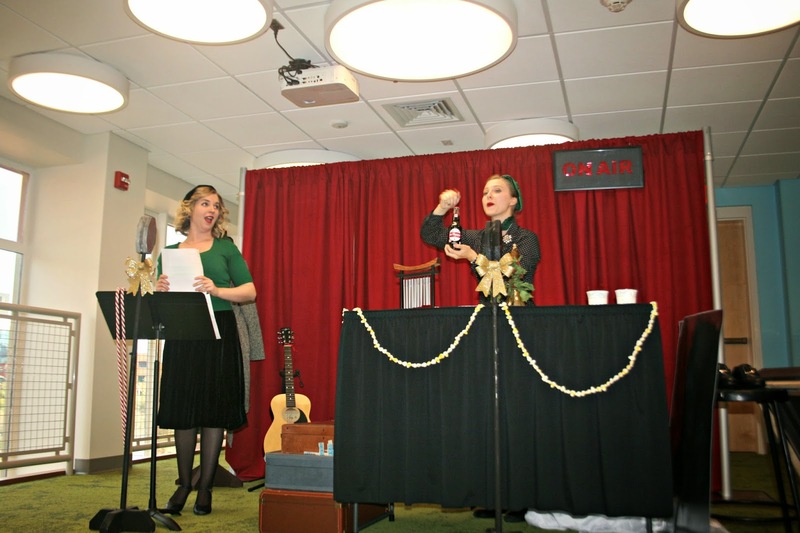 They made it into an old school radio rendition of the play, complete with audience interaction. The boys got to sing/read along at times. This kept their interest. And while they didn't get to see Scrooge or the ghosts, they got to see how the sounds of radio shows were made - the clanking of chains and the thunder of a storm. I think they really enjoyed the performance. 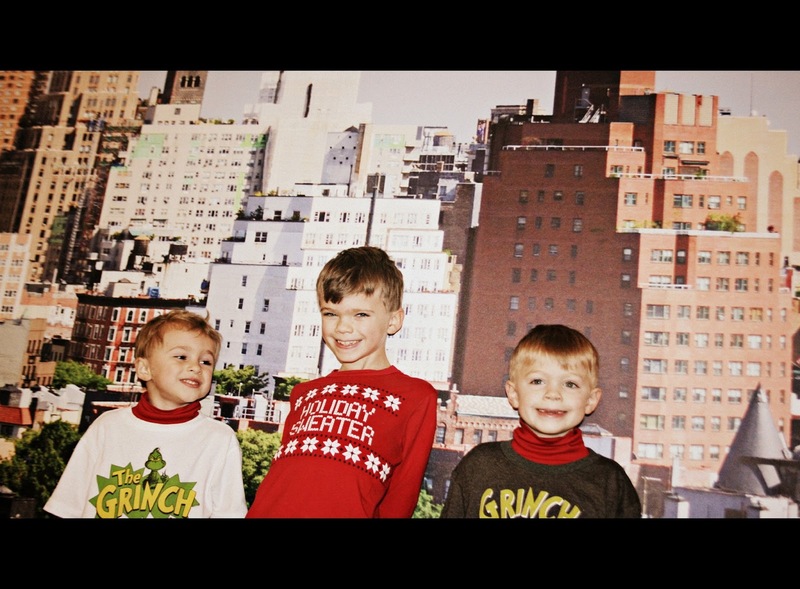 Here are the boys against a mural of downtown Roanoke that is on the upper level of the library. Smiles all around! Readers, do you have any special Christmas memories of something fun you did with your family one year? Memories of Christmas past... I remember the year my oldest brother snuck a puppy under the tree for me, my present from Santa. Since I saw him, I knew there was no 'Santa' as such, but learned something much better; that regular people could be Santa for one another! Lots of neat stuff to do downtown for kids now a days. When I was a kid you stayed away from downtown Roanoke: BAD! This sounds fun. I have went to the Nutcracker every year put on by a local ballet. Headed to Mannheim Steamroller next. I am frequently amazed that in addition to being a working mom with two jobs and a family, you manage to arrange all these trips for your kids. I remember how hard that was to do when ours were little and I was working two jobs. kind of a neat way to present it! This sounds really neat, especially with the radio aspect. We didn't do a lot beyond family gatherings when I was little. My dad's side of the family usually met for a meal at my uncle's house. He worked for Dr. Pepper and he was always offering everyone bottles of Dr. Pepper. I think of those times whenever I drink a Dr. Pepper nowadays. We love to go to the Opryland Hotel at Christmas. Their lights and decorations are incredible! I've been to that theater, and was impressed too. The pictures you have here are great, I love that last one because they all look so happy! This is cool! And maybe the mini one was better for attention span. Good that it was interactive too! We have something downtown that is the Old Fashioned Radio hour. We have a couple traditions with the kids. First, DH reads the original Dickens A Christmas Carol to them for about 13 nights before Christmas, concluding on the 24th. We also watch the DVD of A Christmas Carol (Alistair Sim's version of course!) on Christmas Eve. What a fun way to learn an old story! My favorite times were when my Grandparents would come to stay over Christmas....they spoiled me like no one else! They are so cute. We used to have breakfast with Santa at Marshall Field's every year. The boys' smiles made me smile. When I had young'uns, we took them to Six Flags Over Texas for their annual Christmas festivities. The kids loved it. love looking at your photos, and all the memories! That was a great experience for them! They're such cuties!! Sorry I haven’t been around much lately. I do try to read blogs—but just haven’t commented very much lately like I usually try to do. Please don’t give up on me. Hopefully my life will be back to ‘normal’— whatever that is (ha), sometime in January. I did get a cortisone shot in my knee —which has helped with the pain somewhat. In January, I will most likely have meniscus tear surgery…. BUT—in the meantime, I plan to have a fantastic Christmas —and hopefully get to see my kids/grands… God is Good. How fun! I went on a field trip when I was a kid to. We have it here in Omaha. It's pretty expensive for a whole family to go though. I'd rather saving my bucks and go to Cirque du Soleil. One year we went to Lion King. Your children are very beautiful. I am sure their performance should have been exciting during the show. Glad they were able to participate in that. Sounds like a nice time!